This system is installed in the MF385/385 4WD tractors, which allows the driver/operator to control the steering system with ease. 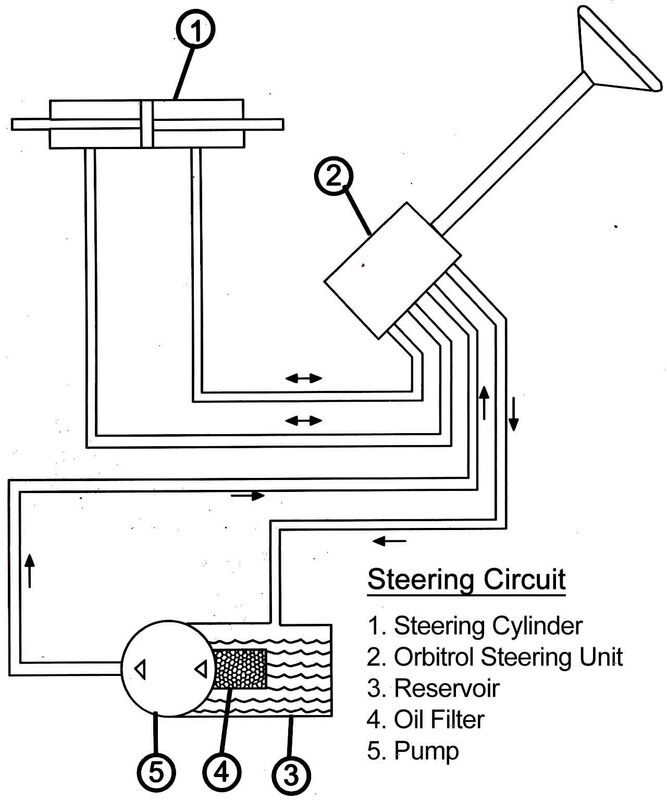 Hydro-static power steering system is a complete power steering system in which there is no mechanical connection between the steering wheel and the front wheels, which allows the steering wheel to be turned with only one or two fingers. This tractor is especially suitable for working with front-end loaders. 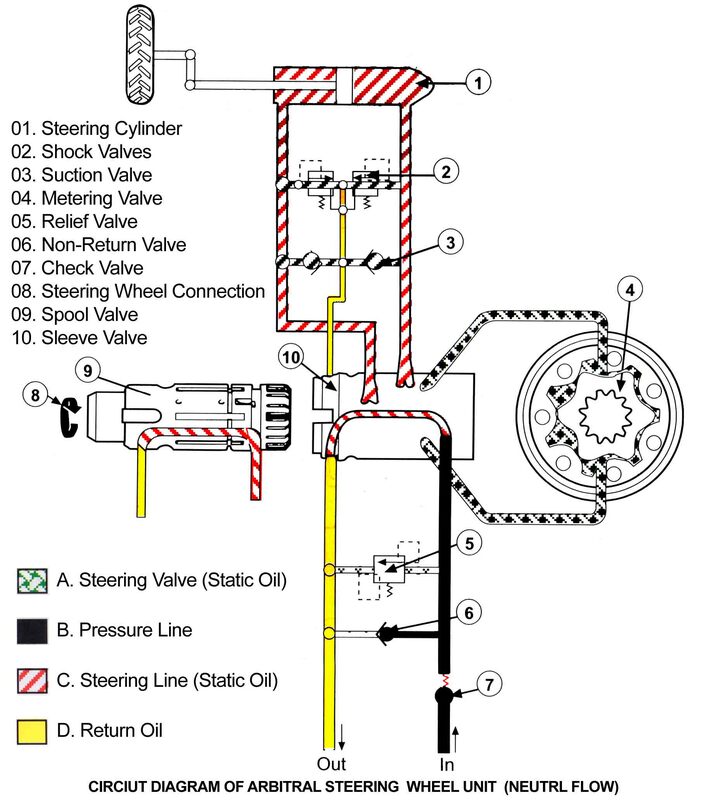 In this oil system is supplied to the steering control unit through steering pump, due to which controlled quantity of oil reaches the right and left sides by the steering cylinder when the steering wheel is turned; and when the steering wheel is straight, the steering unit bypasses the oil supply. This is the neutral position of the steering unit. 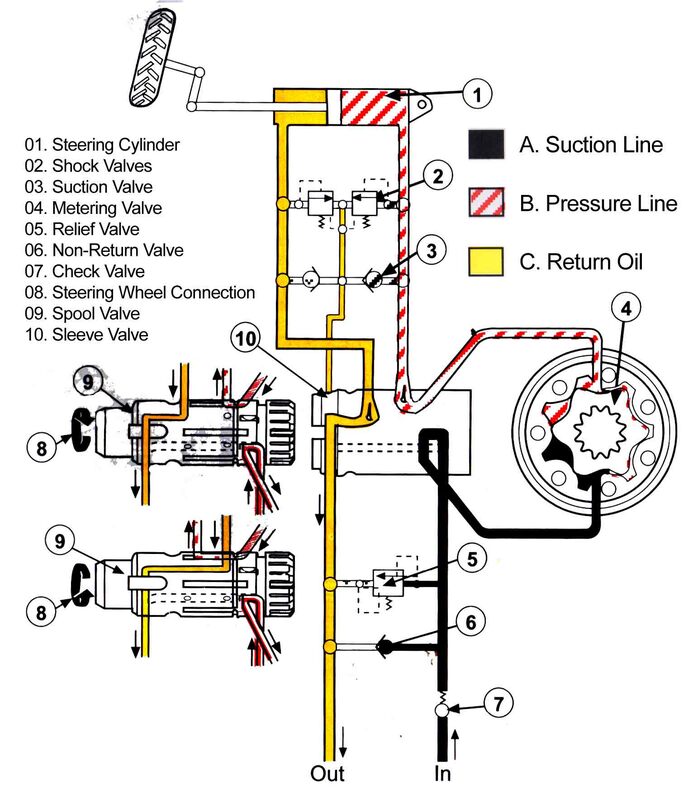 In this position the oil flows from the hydraulic pump to the steering unit, and because of the oil spool and sleeve hole being in straight position the oil returns to the steering pump. In this system two shock valves and two suction valves are fitted on the right and left sides of the steering unit. Shock valves are used between the steering rim cylinder and steering ring control unit to protect this system, whereas the suction valves are used to compensate any shortage of oil in the system. On first movement of the steering wheel the right and left turning holes become straight with each other, so that oil can be supplied to the oil hand pump. Subsequently, the second movement turns the steering and the hand pump. Simultaneously, the hand pump measures the quantity of oil and pushes it back towards the spool and sleeve. The oil coming back enters the spool valve through the grooves, which connect the holes together straightly so that the oil could go to the direction in which the steering wheel was turned. With the spool valve and sleeve holes being face to face with each other, the oil coming back from the steering cylinder returns to the circuit. The relief valve between the inlet and the spool inside the steering unit, which protects against the high-pressure created inside the pump, for example, due to an obstruction while the front wheels are turning. From the steering pump to the steering unit, there is a check valve installed on the way. This is a one-way valve that prevents high-pressure while the steering is being turned. The pump stops working when the engine is turned off, due to which the oil starts to pass through a bypass valve installed inside the steering unit between the supply and return holes. As the pump starts to function, the oil pressure shuts off the valve by pushing it onto its seat. 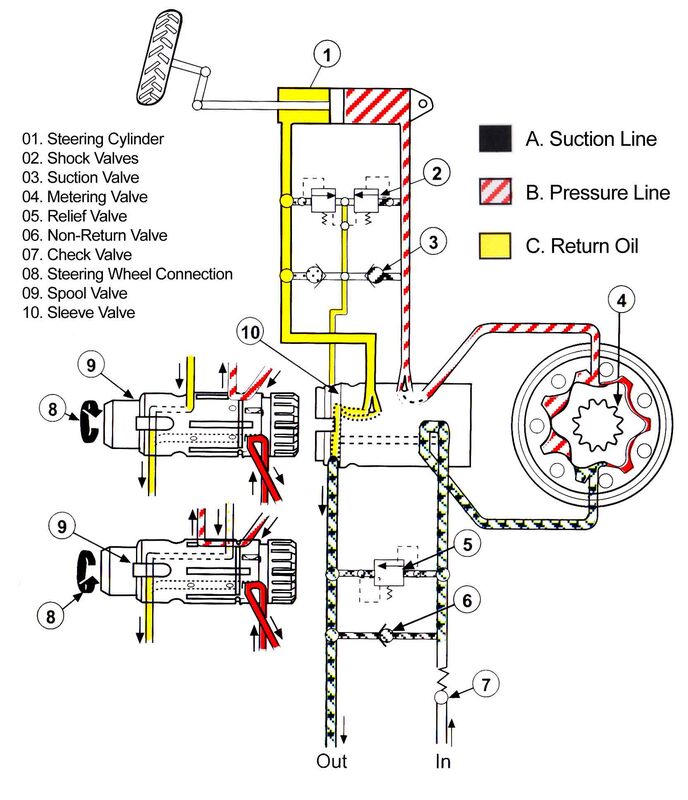 When the pump cylinder is low, the oil returning from the steering cylinder towards the valve inlet side is bypassed. With the help of this function, the oil can move from one side to the other inside the steering cylinder to maintain uninterrupted steering control.